It has been so hard to write this post. 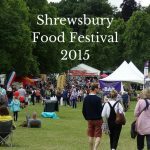 The Shrewsbury Food Festival had such a lot to see and do, that it’s hard to condense it into a single post. But I will try my best to do it justice! Keep your fingers crossed that the weather stays dry over the weekend, because I’ll be heading off to the third annual Shrewsbury Food Festival! Around 200 exhibitors will be in Shrewsbury’s Quarry Park for the Festival on 27th and 28th June 2015. They’ll be providing artisan food and drink to the crowds of visitors. It didn’t feel much like summer when Mark and I headed off to the NEC in Birmingham last weekend. The temperature struggled to reach 15C, and the rain was fairly constant for much of the day. But we still managed to have a good time at the Good Food Summer Show and Gardener’s World Live.